Pocket pairs can be among the hardest cards of all to play. They often feel a lot stronger than they actually are, especially high pairs and can therefore be very frustrating to play. Especially if they are overplayed which often can cost a big chunk of your stack. Generally speaking it can be said that it is better to fold or underplay pairs than it is to overplay them since money not lost are worth just as much as money won. Pocket pairs should generally be played more aggressively in tournaments than they should in cash games. This is especially true in the later stages of a tournament. How aggressive they should be played depend on the size of your stack. If you are low stacked or one of the chip leaders they should generally be played very aggressive. If you are anywhere in between they should be played more carefully. You should know that the odds of improving a pocket pair to trips on the flop is about 7:1. This is especially important to know with low pairs as pot odds might decide whether or not they should be played. Lets look at some pairs and how to play them. AA: Pocket rockets. A pair of aces should always be played very aggressive preflop and if possible you should try to get all your money in preflop. 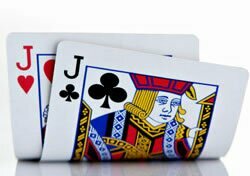 A pair of aces is a very strong hand and is bound to be the overdog regardless of what your opponent have. This is especially true for hands where an opponent is more likely to call such as KK,QQ and AK suited. The strength of a pair of aces might be a lot more questionable after the flop and you should therefore always try to get as much money as possible in pref lop even if this will mean that you risk killing the hand preflop if there are no one with a strong enough hand to call. A small win is better than the massive loss you might suffer by letting people see the flop too cheaply. Play more carefully post flop. Do not allow this hand to go past the flop unless all chips are already on the table. KK a bit weaker than AA and a big underdog if they come up against AA but should still be played in a similar way to AA. It is unlikely that your opponent will sit with AA, even of it will happen and you will win money in the long run playing this very aggressively. QQ-TT These are the most dangerous pairs in the game as they are often overvalued. These hands are usually a lot weaker than you think and should never be played too aggressively. Do not try to get all your chips in preflop with these hands in a cash game. The reason this should be avoided is that it is likely to be at best a coin toss and at worst you might be a massive underdog. Your opponents are most likely to call a big bet or an all in bet with AA, KK or AK. AA and KK are both massive over dogs and AK will be a coin toss with you as just a very slight favorite. It might be worth raising these hand preflop but be aware of the weakness and do not be afraid to fold them post flop. Do not make the mistake of falling in love with your preflop hand. It might be junk post flop. Low Pairs: Play only if the pots odds and the chance of hitting the trips supports it. Do not be afraid to fold these hands. They are a lot worse than they might seem.